- Are you crazy about someone but they just see you as friends? - Dreaming of something more romantic...but you’ve had to keep it a secret? - Do you have feelings for your teammate, colleague or housemate….but they have no idea? - Is it time to let them know how you feel? 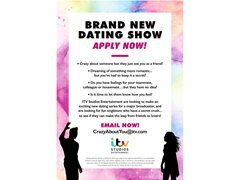 ITV Studios Entertainment are looking to make an exciting new dating series for a major broadcaster and are looking for fun singletons who have a secret crush...to see if they can make the leap from friends to lovers! If you want your bestfriend to become your bae, have a crush on a co worker or fancy your fitness instructor...this is your chance!